The International League of Peoples’ Struggle in Canada (ILPS) strongly condemns the latest US-led military attacks on Syria, based once again on unverified information that Syria used chemical weapons in Douma. 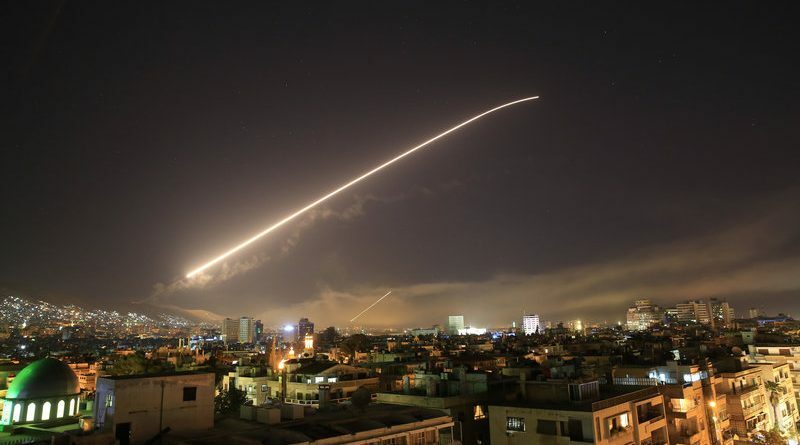 Over 100 missiles battered three targets: a scientific research centre in Damascus, a purported chemical weapons storage facility west of Homs, and another supposed site and command post nearby. 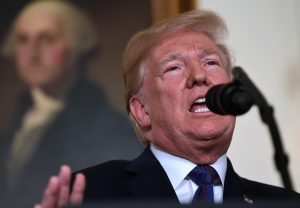 This murderous action by the US, Britain and France cheered on by NATO (including Canada) is a gross and grievous war crime, an act of aggression against a sovereign state that violates all precepts of the imperialists’ own international law. Syria has not attacked the United States, Britain or France, and there is no U.N. Security Council authorization for a strike on Syria. The ILPS calls on our chapters and member organization to stand with the people of Syria against this deadly escalation of what has been an 7-year proxy war for “regime change” in Syria led by the US and its client state Saudi Arabia along with Turkey and Israel backed by imperialist powers like Britain and France. The intensifying propaganda against the Assad government is part of a broader effort to justify intervention and ultimately install a pro-US regime and open up again the Syrian economy to unbridled imperialist exploitation and plunder. In their efforts to destabilize Assad, the US and its allies have supported and armed Islamic terrorist groups in Syria such as Al-Nusra and Al-Qaeda. Now that the ground war is largely over and the Syrian Government has stabilized Syria, the US and its allies are seeking new avenues to continue their strategy of destabilization. We have already seen the disastrous results of the “regime change” aggression in Libya, a country that was destroyed in 2011 and its vast oil, water and other riches divided up among the imperialist powers. Similar strategies are underway in Afghanistan, Somalia, Yemen, Iraq and elsewhere. In lock step with the US, Canada has taken a hostile position towards the Assad government, supporting the ongoing strategy of regime change. The Canadian Government has clearly illustrated this as recently as April 13 when Prime Minister Trudeau made a statement in support of US military intervention and bombing campaigns in the region. The latest accusation of a chemical attack by Syria shows once again all the signs of a false flag operation. There has not yet been an independent international investigation. The Organization for the Prohibition of Chemical Weapons, the OPCW, is presently in Damascas preparing to send a fact-finding mission to the ground in Douma, Syria, which the Syrian government has welcomed. And the group that controlled Douma, Jaysh al-Islam, where the chemical attack by the Syrian government supposedly took place, is notorious for carrying out attacks against civilians. In fact, mainstream human rights organizations such as Human Rights Watch, Amnesty International, and others have documented Jaysh al-Islam’s attacks on civilians, including putting Alawite women in cages. Also, why would the Assad government have carried out such an attack when they were already capturing Douma, the last opposition stronghold in Eastern Ghouta? In fact, the hospital where photos of the victims of the attack were purportedly taken, is now under Syrian government control. So-called US, British and French outrage over the deaths of civilians due to chemical weapons in Syria is hypocritical. Let us remember that the US is supplying the Saudi government with white phosphorous and other horror weapons it is raining down on the children of Yemen. US ships are helping the Saudi kingdom, the US war industry’s top paying customer, to blockade and starve the people of Yemen. And the US and other imperialist powers have done nothing to stop the Turkish regime of Recep Tayyip Erdogan from entering into Syria and attacking and killing Kurds at Afrin and elsewhere. These same Kurds were among the leading forces in defeating the terrorist forces of ISIS! The US supplies the weapons of mass destruction the racist Israeli state has used to slaughter the children, women and men of Gaza again and again. It arms the Israeli soldiers who shot down to date 33 unarmed civilians peacefully participating in the Great March of Return along the border of Gaza. Humanitarian motives do not and have never had anything to do with the actions of the US-led war machines. US President Trump announces April 13, 2018 attack on Syria. The US state apparatus has a long history of lies and fabricated or manufactured “incidents” to justify wars for corporate profit. These include the fabricated Gulf of Tonkin incident used to justify US mass murder in Vietnam and the Bush regime’s lies about Iraqi weapons of mass destruction. And as for Britain and France, their blood-soaked histories in Syria and West Asia stretch all the way back to the secret Sykes Picot Agreement of 1916, when the region was carved up by both European powers as the Ottoman Empire was collapsing during the First World War. The Syrian military disposed of its chemical weapons under UN supervision. No such verification of the so-called “rebel” forces took place. There is considerable evidence, including a 2014 report by journalist Seymour Hersh, that US-backed terrorist groups in Syria have been supplied with sarin gas from Libya. The ultimate risk is that these acts of US-led aggression can easily escalate into a wider war. To the US and its imperialist allies we say, Hands off Syria! Oppose US-led Wars of Aggression! Oppose Canada’s shameful puppet policies on Syria! Defend the Sovereignty of Syria! Stop the Bombing, Stop the Slaughter!